Edward Sharpe & The Magnetic Zeros brought the festival to life. With the feeling of a revival this band of wonderful musicians commenced to make everyone dance and sing along. They opened with a nice “40 Day Dream.” I am especially a big fan of the song “Home ,” which was a big hit with the crowd. Edward Sharpe and the Magnetic Zeros were a highlight for me. They also played the tunes “Janglin” and “Come In Please” from the new album Edward Sharpe & The Magnetic Zeros . The charismatic Alex Ebert leads the band while Jade Castrinos brings a powerful vocal punch to the mix. In fact, I hope to see more of Jade on future releases. The Eagles opened their set with the full on harmonies from “Seven Bridges Road .” As the band sang “there are stars in the Southern skies,” the crowd erupted. From there we went on a wild ride through the Eagles catalog from “How Long ” to “Take It To The Limit.” A trumpet solo introduced “Hotel California .” Quite frankly, I have been waiting a lifetime to hear “Hotel California ” performed live. The cover material was followed by the hard-hitting social message laden tune “In The City.” In fact, I had never realized the political overtones in the Eagles material. The choreographed video and light show added emphasis to the social message in the song. “In The City” was followed by the classic track “The Long Run .” My favorite moment came when the band broke into the Joe Walsh tune “Life’s Been Good .” Before Spinal Tap poked fun at the rock star lifestyle, Joe Walsh had done it in this expose of excess and partying. After this, I was curious how the band would finale considering the amazing songs that had already been played. That 1 Guy and his magic pipe stole the show at the Granada Theatre this Friday night in Dallas. Mike Silverman aka That 1 Guy is a classically trained double bass player from the San Francisco Conservatory. He has developed a new instrument–the magic pipe. 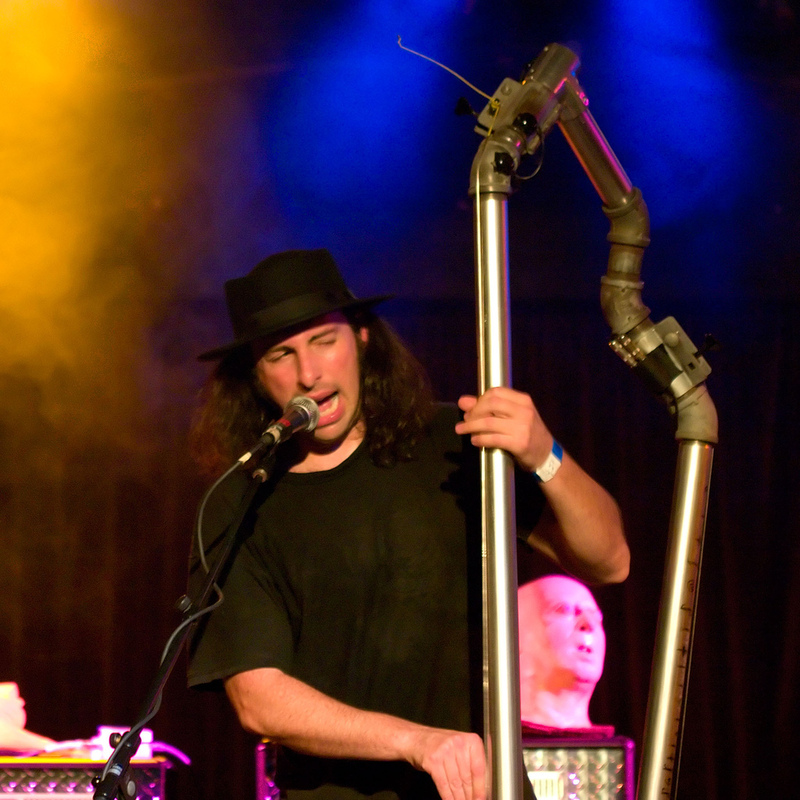 A seven foot tall collection of steel plumbing pipes and joints, orchestral bass, and electronics, the magic pipe makes some crazy and amazing sounds. You must see Silverman’s creation in order to fully grasp the genius of this new instrument. Crazy tunes like “Weasel Potpie ” grip the audience and make them dance. Furthermore when he added a wobbling handsaw to play “Somewhere Over The Rainbow ” minds were blown. On the way up Highway 101 from Humboldt County to the Redwoods I tuned into K-MUD, a local Humboldt station and heard a wonderful band–Wake the Dead. It is always nice to hear something new and refreshing and this particular radio station and band hit the spot. The Northern California celtic jam band celebrates the Grateful Dead interpreting the Dead’s catalog in new and exciting ways. I really got into Wake the Dead, finding their tunes a pleasant accompaniment to the scenic vistas of Humboldt County. 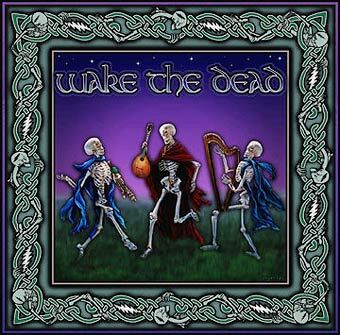 I found the album Wake the Dead: A Celtic Celebration of the Songs of the Grateful Dead to be a fair example of some of the tunes I heard on K-MUD.